ABT’s season opening program was a knockout—Mark Morris’ premiere of After You, Ashton’s Monotones I & II, and Twyla Tharp’s Brahms/Haydn Variations. After You is a lovely, coursing rollick in which the dancers hold hands, march downstage, and embrace us with their warmth from the outset. 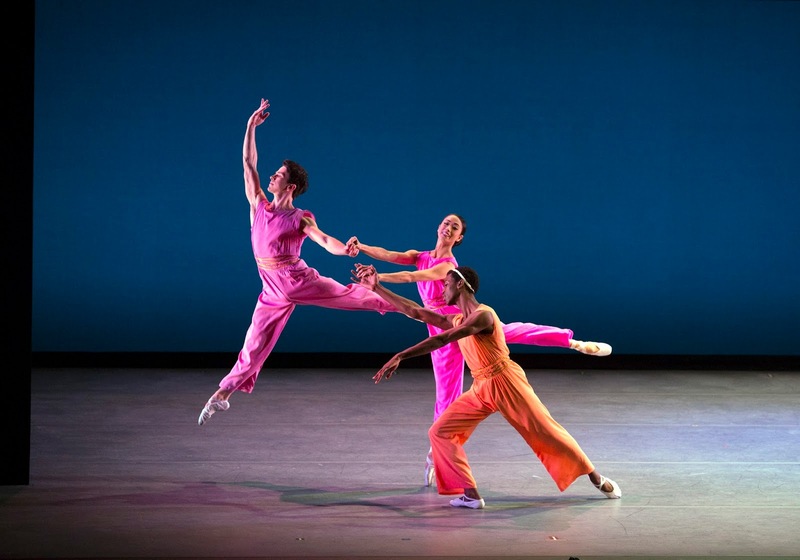 Led by Gillian Murphy and Stella Abrera, they sport hot pink or orange jumpsuits with flowing legs, and dash and dart about in pairs and trios, clicking into and out of lines broken up by piqué turns. 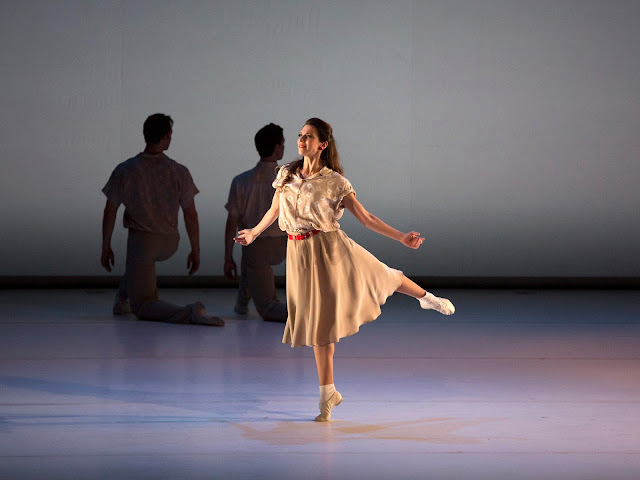 Morris can make a simple walk engrossing, and here he uses basic ballet phrases—chassée, pas de bourrée—with varying direction shifts and arm combinations in a similar way, as a grounding device. Repeating motifs include arms arranged like clockhands at 5:20, or in a sharp-elbowed “U”; one particularly delightful phrase, initiated by Calvin Royal, linked together sautés and modified barrel leaps. In a second cast, Boylston and Cornejo shone, with notables Blaine Hoven, Stephanie Williams, and Roman Zhurbin. Of Monotones I & II, the dancers’ identitities are somewhat difficult to discern, hidden under Ashton’s headcaps. But it’s all about the shapes and triangulations created by each trio, one in green, another in white. Joseph Gorak, master of line, paired well with an incisive Abrera and Boylston, and in II, Veronika Part was eloquent and plush stewarded by Cory Stearns and an elegant Thomas Forster. The Satie Gymnopédies, played in full orchestration, sounded a bit like elevator music, but their general hypnotic mood set the foundation for the works. On another program, Daniil Simkin embodied the Rose in Fokine’s Le Spectre de la Rose, with Cassandra Trenary as the Young Girl. It’s the best kind of role for Simkin, who sailed effortlessly alone around the salon set, apart from a slip and fall (which demonstrated his unfettered confidence), and a couple of overly self-conscious poses. In Balanchine’s Valse Fantaisie, Gorak, an epitome of classicism, similarly was cast perfectly, dancing with Devon Teuscher, who circled the stage smoothly in split grand jetes. The company brought back Paul Taylor’s Company B. Casting is so important in this bittersweet wartime ballet, and it was a joy to see Craig Salstein as the nerdy crush, Johnny, and Luciana Paris warmly romantic in "I Can Dream." Gorak was given the long solo in "Boogie Woogie Bugle Boy"—a slight stretch for his controlled demeanor—letting loose a bit and enjoying it. Misty Copeland danced "Rum and Coca Cola," understandably wowing the guys with her sassy hip checks and skirt flounces. The dance is structured well to showcase the company’s varied and deep talent, and in an idiom translatable to ballet, yet more fun. The short season runs through this week at the Koch Theater.